I must confess that for a long time I didn't know how important it is to protect your skin against sun rays. Despite having a medical science background I was careless to the effects of sun on my skin. I knew everything about skin cancer and the consequences of environment stress. But for some reason I never used tanning beds but considered tanning on the beach somehow ok. It's not that I didn't use any sun protection for my face, I did! But only on the beach. Apparently, it was not enough I got tanned and despite knowing that it's bad I was happy to have a "healthy sun glow". I know ridiculous but we were / and still are all influenced by the western tan - obsessed culture. After getting older, now 26 and starting to care about anti-aging I realized that I was doing damage all this years. I developed some small lines on my forehead, nasolabial folds and visible pigmentations. I blame my behavior also on living for some time in south France. The French brought tanning in the 20s (Coco Chanel they say, later made popular by Brigitte Bardot) and it became popular in western world. To my knowledge people in the US are becoming more aware of sun damage and use sunscreen,tanning spray salons etc. to get a fake tan. Nevertheless, the French didn't really adapt this habit and like to 'grill' in the sun. It's quit unpopular in France, especially in the south, to have a fake tan and everybody is expected to be naturally tanned. A fake tan is a no-no because you are living in the south. When I lived there I was knew of photo aging and didn't want to tan a lot. I saw for the first time in my life so many French girls/women with sun spots, pigmentations, freckles and yellow dull looking face. Don't get me wrong I don't want to offend French women and I'm sure many are using sunscreens. But In general I think a change in awareness of sun damage is needed. For more about this check this video out; https://www.youtube.com/watch?v=eeHgv1W_hRg, its by a French blogger about the attitude of French women towards sun protection. This was an introduction to what led me to start using sunscreen on my face and think about the consequences could be if I don't. It's important to protect your skin everyday even in the winter. It's the best anti-aging cream you can get, maximum UVA/UVA protection. Shield your skin from damaging UV rays!!! 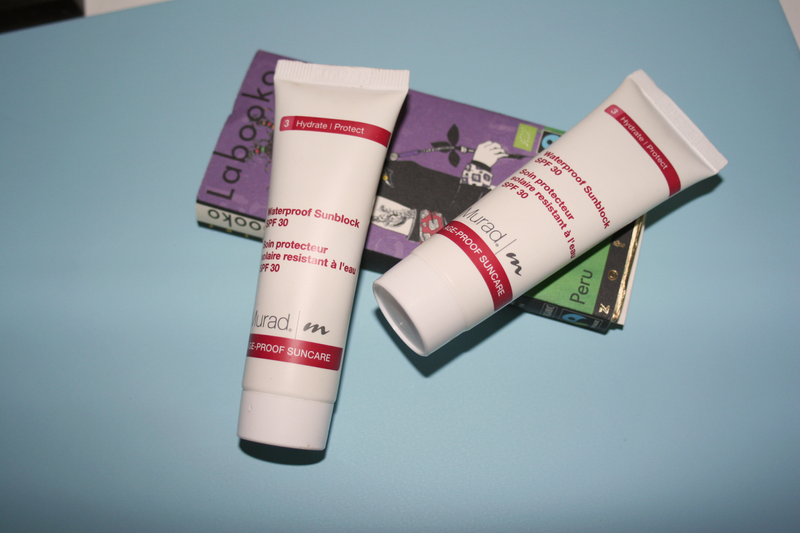 One of the first real sunscreen that I started using was the Murad sunblock. I had some small 30 ml tubes that I bought from a beauty website here in Holland during a sale period, it must have been a year ago. The sunscreen is a chemical sunscreen. Chemical sunscreens work by absorbing the sun rays. The active ingredients are: avobenzone, homosalate, octinoxate, octisalate, oxybenzone. 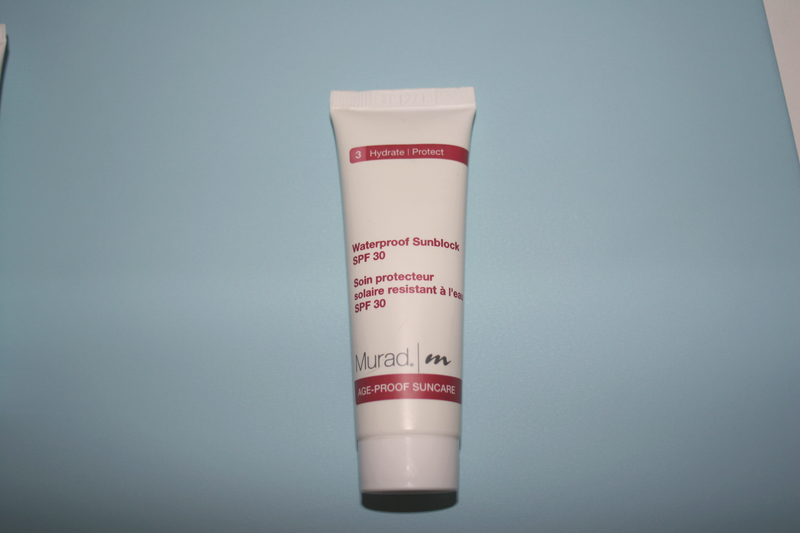 Murad sunblock has full UVA/UVB protection SPF 30 waterproof formula, which utilizes three active sunscreens. It claims to resists water and free radical damage and helps lock in moisture and maintain skin firmness. Contains vitamin C, Hyaluronic Acid and Phytolipids. - Hyaluronic Acid is a very popular skin care ingredient with a lot of scientific proof, it boost skin's moisture content, reduce inflammation, has cell-communicating abilities and help prevent moisture loss. - Vitamin C is my all-time favorite ingredient! There is so much scientific research showings it's skin benefits. It Reduce the appearance of brown spots and other types of sun damage. Helps boost healthy collagen production. The instructions says to apply it for 30 minutes prior to sun exposure and reapply after 80 minutes the water or after excessive perspiring. I used the sunscreen in the hot summer months especially on the beach, because of the water proof claims. The texture is really thick creamy and difficult to spread, I didn't like that. However, it's water resistance and thus has a long staying power. My face is really sweat proof when I'm using it but it does have a white cast effect. The sunscreen didn't cause any breakouts or any other reaction on my sensitive skin. In general sunscreens tend to be drying, and the murad is no exception with its thick texture and mat finish. That's why I would use it only in the very hot summer days or on the beach, otherwise it's not moisturizing enough. For oily skin it's probably okay for daily use. 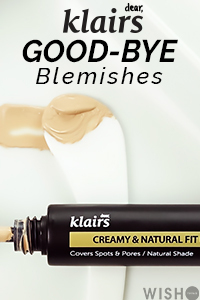 Overall I use this sunscreen during very hot days and when my skin tends to be oily. If you want to buy the full size it's about 30 Dollars, it’s not expensive for the 125 ml full size product. 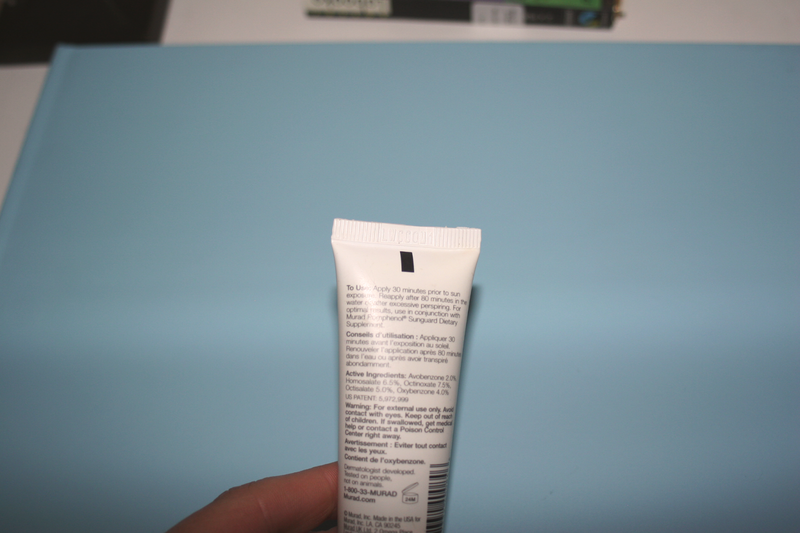 Normally, face sunscreens contain 50-60 ml a tube. I don't think I will repurchase it again in the near future, there are many other brands I can't wait to try out , I'm now moving into the territory of Japanese sunscreens, nobody makes them so good as the Japanese; usually they tend to be lightweight and cheaper compared to western brands. I also prefer a sunscreen with both chemical and physical filters. Physical sunscreens protect your skin from the sun by deflecting or blocking the UV rays where chemical sunscreen absorb UV rays. But the ingredients vitamin C (high in the ingredient list) and Hyaluronic Acid are really good skin care ingredients. - not expensive 30 dollars for 125 ml!